Our annual joint practice with Virginia Kyudo Renmei was held on Saturday, October 4th at the Jersey City Education & Recreation Center (CERC). 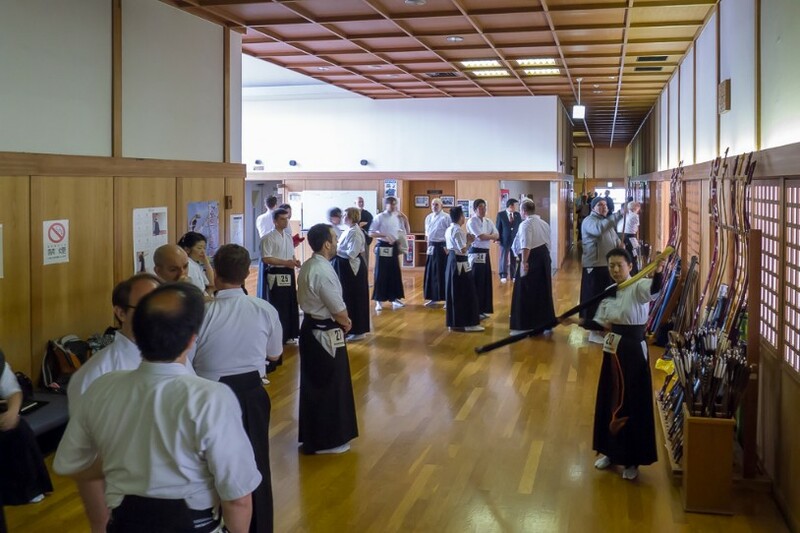 Unfortunately, Bill Reid Sensei could not attend to lead joint practice; however, all the participants learned something new through this all day annual event. 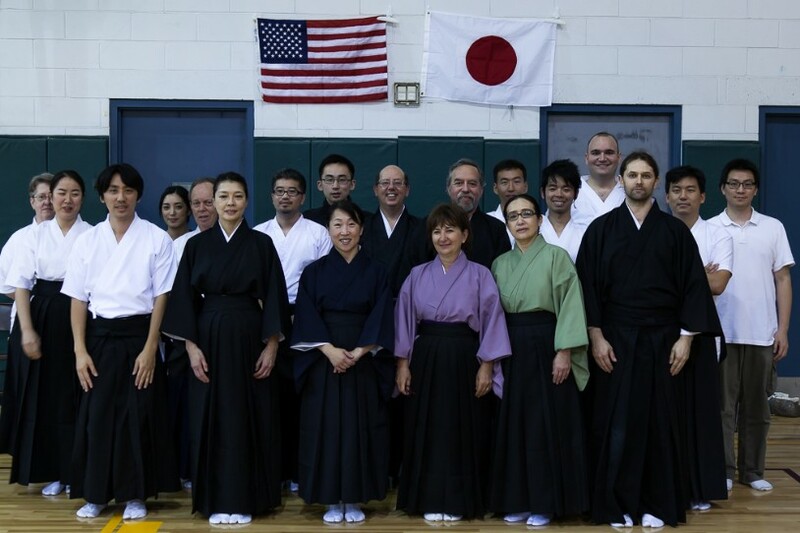 The joint practice started with an opening ceremony and followed by instructions from NY/NJ Kyudo Kai Sensei, Fumiko Takada and Brian Schiff from Virginia Kyudo Renmei. For some of beginner students, it was the opportunity to release arrows to the 28-meter mato (target) for the first time. We all had some additional time to practice with the 28-meter mato setting before lunch. The afternoon session started with Hadanugi and Tasuki practice which we had a rare opportunity to learn how to wear a kimono properly, and perform Hadanugi and Tasuki-gake. We then had a chance to observe a Yawatashi by Brian Schiff - Ite, Fumiko Takada - Dai 1 Kaizoe and Krzysztof Sienkiewicz- Dai 2 Kaizoe. The day was ended with a Taikai - Competition where each person was able to shoot 8 arrows to the target. Congratulations to the winners: 1st place Fumiko, 2nd Jimmy and 3rd Maki. NY/NJ Kyudo Kai would like to thank everyone who came to the event as well as the members who contributed in organizing the day. Hope to see you all next year. 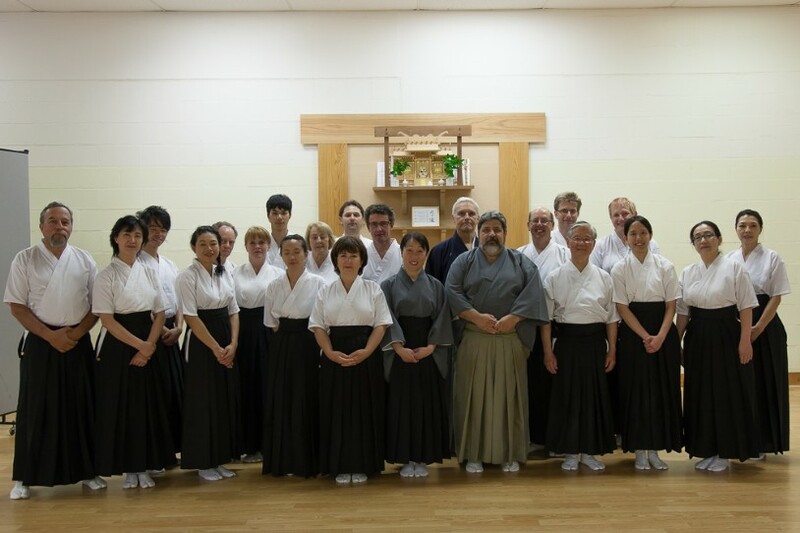 This year's Virginia Kyudo Seminar with Dan DeProspero Sensei took place on June 21 and 22, 2014. The first day was at the Alexandria Dojo in downtown Alexandria, VA., and the second day was at the outdoor Dojo at the backyard of Bill (of the Virginia Renmei) Sensei’s home. All the participants enjoyed the seminar at two different locations, but especially the practice at the Dojo in the beautiful backyard was outstanding. A bald eagle showed up for our good luck right before the practice and was observing us from the top of the tree. Then she/he took off as he probably figured out what we were going to do. He looked so beautiful! The seminar was instructed by Dan Sensei with the support of Bill Sensei and Fumiko (of the NJ/Y Kyudo-kai) Sensei. Every participants got her/his own personal instruction from Dan Sensei to improve technical skills and/or correct forms, but overall, it was a great seminar to bring us back to the basics, regardless of the level. We were reminded that, to achieve the right mind shooting, we need to be aware of the fundamentals: right way of walking, standing, sitting, mezukai, breathing and so forth. All written in Kyohon! We always need to be mindful. Thank you very much, Dan Sensei, for the important teaching to us. And the hospitality provided by the Virginia Kyudo Renmei was wonderful. They set up the clean and beautiful Dojo for the seminar. The healthy and well- balanced buffet lunch was very delicious. Their restaurant choice for two days after the seminar was excellent, and the participants really enjoyed the Japanese and Indian foods. But the most impressive treat was Bill Sensei’s coffee! It was out of this world!! Our next joint seminar with the Virginia group will be early in October at the Dojo either in New Jersey or New York. We hope to see you all again, and whoever could not make this time, we will see you then! Again Dan Sensei, thank you very much for the wonderful seminar! With every year growing in attendance, The Third Asia Oceania Kyudo Seminar was conducted in 2 sessions. First session: Thursday, April 10, 2014– Saturday, April 12, 2014 with Shinsa on Sunday, April 13, 2014 was for participants from Europe and United States. Second session: Tuesday,April 15, 2014 – Thursday, April 17, 2014 with Shinsa on Friday, April 18, 2014 was for participants from Asia and Oceania. There were over hundred people attending Europe and US session and over seventy attending Asia and Oceania session. Opening ceremony was held on April 10th at 9:30am. Followed by the first day of the seminar ended at 5pm. After 5pm. the dojo was available to free practice. Second day started at 9am, and after 1h brake at noon continued until 4:30pm. The reception was held at 6pm, when we all could meet and talk with our friends and teachers. The third day seminar was held from 9am to 11:30am when the closing ceremony ended the seminar. After 1.5h brake we received shinsa instructions from the senseis. With so many teachers the seminar was very intense and we received many good instructions. On Sunday, April 13th, after opening ceremony at 9am, shinsa was carried out. Everyone was prepared very well for the exam. It was very nice to meet old friends and make new. Hope to meet all again.